This isn't a real review, more an intro. Currently selling for $93 on Amazon, I scooped one up for about half that (I think one of their code monkeys input a 5 instead of a 9, their loss, my gain). Weighs 700g or less than 1.5 lbs. Definitely a luxury item. Packs down to approx. the size of the Helinox One chair. I carry mine more often than not because when i go hiking I go to enjoy myself, not see how many miles I can do (been there, done that, with 100+ lb packs. I like to sit under my tarp during a rain storm, comfy in my chair with my table beside me. 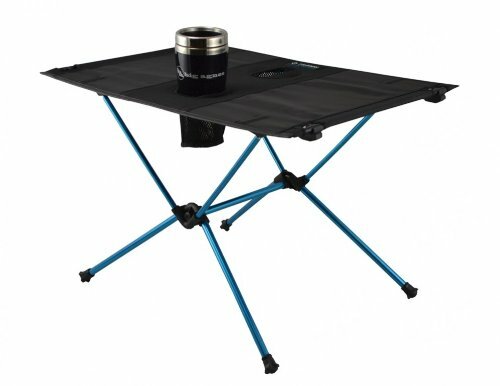 I use it as a cook table with my Jetboil. Final thoughts... IS it worth $90? thats an individual decision. On sale? Hell yeah. Worth the extra weight? WITH my chair and table my base weight is below 20lbs, usually closer to 15. If 1.5 pounds is that big an issue I would be better served by losing some of my gut.